So Ummm… What is a Chatbot? 2017 is the year of the chatbot revolution–chatbots are starting to pop up all over Facebook, retail websites, and even federal/state/local government websites. This begs the question: what exactly is a chatbot? 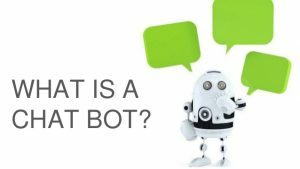 Do you need a primer to explain what a chatbot is and how it can help your government agency? Do you want to understand the benefits that chatbots can offer? Well, look no further! – What technologies are used to make chatbots? – How much does a chatbot cost? Chatbots 101: What Benefits Do Chatbots Provide? Chatbots 101: What Technologies Are Used To Make Chatbots? cFocus Software exclusively builds chatbots using the Microsoft Bot Framework, Microsoft Language Understanding Intelligence Services (LUIS), and Microsoft Cognitive Services. Amazon Lex is a service for building conversational interfaces into any application using voice and text, and is powered by the same deep learning technologies as Alexa. The IBM Watson™ Conversation service combines machine learning, natural language understanding, and integrated dialog tools to create conversation flows between your apps and your users. Bots for Facebook Messenger allows you to directly build chatbots for Facebook Messenger. Chatbots 101: How Much Does A Chatbot Cost? Asking how much a chatbot costs is similar to asking, ‘how much does a car cost?’ The answer, of course, is: ‘it depends’. A Lamborghini costs more than a Honda Accord, and a chatbot like Alexa is going to cost more than a simple chatbot that can handle 10 requests. With that said, a government agency that wants to add a medium to full-featured chatbot to their public-facing website can expect to pay anywhere from $20,000-$100,000 and above depending on the number of scenarios the chatbot can respond to and the complexity of these scenarios.